One in 4 U.S. adults – 61 million Americans – have a disability that impacts major life activities, according to a report in CDC’s Morbidity and Mortality Weekly Report. 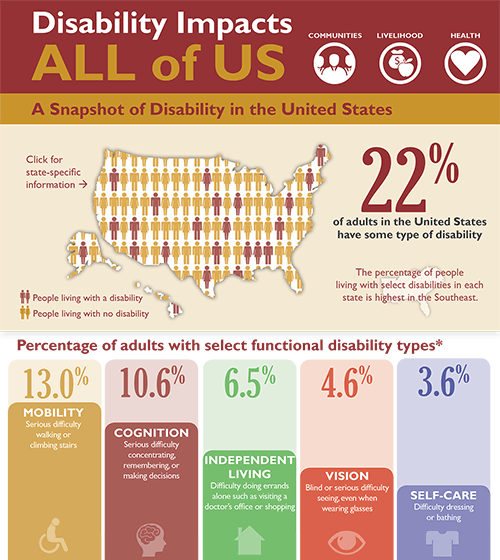 The most common disability type, mobility, affects 1 in 7 adults. With age, disability becomes more common, affecting about 2 in 5 adults age 65 and older. For more information about CDC’s work to support inclusive settings for people with disabilities, go to http://www.cdc.gov/disabilities.